In order to allow MSPControl to manage system resources on some server it should be registered with MSPControl first. Server in MSPControl can be considered as an instance of MSPControl Server application installed on controlled machine. Also, server is a physical/virtual box with corresponding IP addresses and installed applications (services) that will be available to your customers. In order to control the server through MSPControl Server application should be installed and configured there. You can find more about MSPControl architecture in How Does MSPControl Work article. You should specify server access password during the installation of MSPC Server application. This password is used to access Server application on the controlled server and should be specified when registering a new controlled server in MSPC. However, if you've accidentally forgotten the server password or want to change it to something more secure you can run MSPC Installer again on required server. 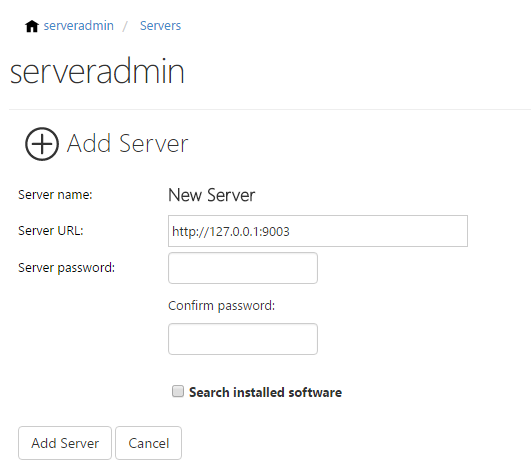 In order to see the list of remote servers sign in under "serveradmin" account and go to Settings > Servers page. Server name - display name of the controlled server visible in MSPControl. It doesn't mean the name of computer, it's just an arbitrary name describing the purpose of controlled server, e.g. "Server 1", "Mail Server 1", "Web Server 3". Server Password - server access password specified during MSPC Server installation. Confirm Password - server access password confirmation. In case you've specified wrong server URL or incorrect password you'll see a corresponding message. "Connection Settings" section - allows to change the URL to Server application on the controlled server (e.g. in case it was moved to other location) and specify a new password to access the server. "Active Directory Settings" section - allows specifying whether all server service user account and groups are created in Active Directory or as local accounts. "Instant Alias" section - allows to specify an "instant alias" on the server-level. 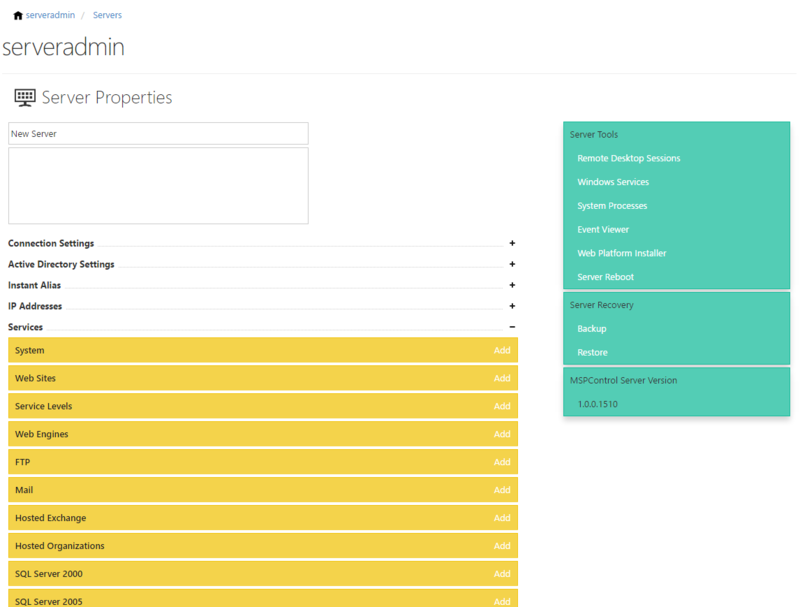 "Services" tab - allows managing the list of installed services (applications) and their corresponding settings. Those services will be provided to hosting customers as hosting resources. "IP Addresses" tab - allows managing the list of IP address assigned to this server. "Global DNS Records" tab - allows managing server-level DNS records. "Terminal Connections" link - allows view/manage active terminal connections. "Windows Services" link - allows view/manage Windows services. "Processes" link - allows to view/manage system processes running on the server. "Reboot" link - allows rebooting the server. If the controlled server is a member of Active Directory domain it can be configured to create users and groups there. Active Directory integration can be configured on server level only, i.e. you can't specify "local" mode for one service (say IIS 8.0) and "AD" mode for another (say "FTP"). Security mode - specify whether accounts will be created locally or in Active Directory. Authentication method - select AD authentication method that will be used by MSPC to access Active Directory. Root domain - specify the root domain in the forest where accounts will be created. The domain should be specified in the form "sub.domain.com". Username, password - use this only if you configure server which has IIS service and if it requires Active directory integration. You need to type credentials of the system account that has rights to manage Active Directory (usually it is a member of "Domain Administrators"). It could be same account as MSPC Server pool account if this account has enought rights. All other services except of IIS use MSPC Server application pool account as an Active Directory identity and you don't need to type Username and Password for servers with other services. This section allows to specify the list of IP addresses assigned to the controlled server. These IP address will be needed when configuring server services. In order to register new IP address click "Add IP Address" button. IP Address - external (or public) IP address visible outside the network. External part of IP address is used when creating DNS zone records. NAT Address - internal (or private) IP address inside the network corresponding to the external one. If you don't have NAT-based network you may leave this field blank and specify on external IP. Internal part of IP address is used when creating web site host headers, mail domain IP binding, etc. To - this field allows you to add a whole range of IP addresses starting from External IP and ending with "To" inclusive. When internal IP is specified it will be also incremented (or decremented) when adding a range. Server assigned - the server to which the given IP address is assigned. User assigned - the user to which the given IP address is assigned. When adding "common" IP addresses you may leave this field as "Empty", but when adding specific IP address that will be used a static IP for some customer web site you should select his user account. Comments - arbitrary comments that would help to distinguish one IP address from another in the list. Click "Update" button to apply your changes. How Many Server IP Addresses Should I Have? We recommend you having at least two IP addresses for each server. Usually such services like DNS and Mail operate more stable when configured to use more than one IP address (primary and secondary DNS zones should resolve to different IP addresses and backup mail exchanger (additional MX record in DNS) should be setup for better mail system availability).